Construction on the Aquatic Center was completed in June of 1999 at a total cost of 1.5 million dollars. The Aquatic Center features a 181 foot water slide, six lap swim lanes, one diving board, a drop slide, zero-depth entry with three water features, large sun deck, a concessions area & much more fun & excitement for everyone. 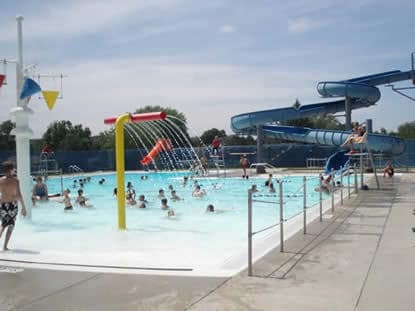 The Aquatic Center will open for the 2019 season on June 1st and close August 18th. The Aquatic Center will be open to the public from 1:00PM to 5:00PM & 7:00PM to 9:00PM, seven days a week. Phone number: 507-932-5386. Aquatic Center Punch Cards. Each “punch” is good for one admission (Youth or Adult) per /day. 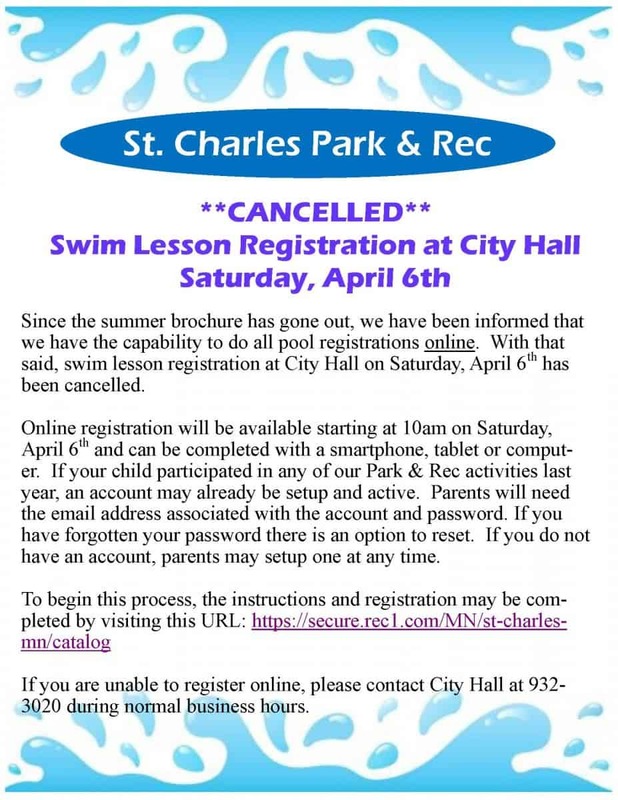 Punch Cards will be printed at City Hall and available for pickup at the pool within 72 hours. Punch Cards purchased may be used same day at the pool. Aquatic Center Tickets/ Memberships are only good for the 2019 season. Membership cards may be picked up at the pool within 72 hours of purchase. If a membership was purchased in 2018, you may use the same membership cards in 2019. Level 2 (Beginners I) – $50.00 – Must be at least 48″ tall. Level 3 (Beginners II) – $50.00 – Second phase of beginners class. $50.00 – Monday – Thursday. Ages 8-18 only. The team will participate in area swim meets, host a swim meet, fundraisers & learn to swim competitively. $40.00 Saturday (8:30AM – 9:30AM) Lessons will be self-paced. Whether your goal is to become a stronger swimmer or to overcome a fear of the water these lessons will help you meet those goals. Infants to 4 years old. At least one parent per/child must be with them in the water. This is a great introduction for kids to the water. ** All instructors are trained in the Red Cross Program & are qualified to teach all classes. If you are doubtful of your own or of your child’s physical condition, consult your physician. The American Red Cross has officially adopted the Guard Start Program! We will offer four sessions of Guard Start this summer. The Guard Start program is a junior lifeguard program for children between the ages of 13-15 who want to enhance their aquatic skills & build a foundation for future courses in lifeguarding. This two week course will focus on Prevention, Fitness, Response, Leadership & Professionalism. Students will also be instructed in basic CPR/First Aid. Participants will be paired with a certified lifeguard to observe & practice the skills they have learned. Kids Triathlon: 1st Saturday in July. Check the events board at the Aquatic Center for more info. Water Aerobics: Check the events board at the Aquatic Center for more info. Swim Meet: The Aquatic Center will be closed to public for this event. Check the events board at the Aquatic Center for more info.